Even though they will continue to share most of the features, the next generation Chevrolet Silverado 1500 and GMC’s Sierra 1500 won’t be the identical twins. 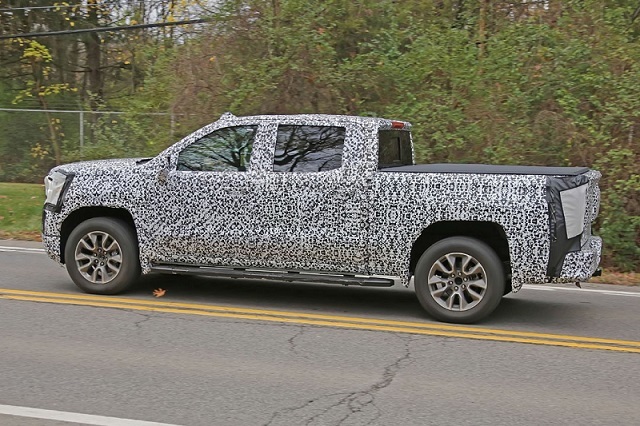 Just a day after we caught Chevy’s future truck, our photographers managed to catch the all-new 2019 GMC Sierra 1500. Although completely camouflaged, the prototype shows some pretty unexpected elements. The new exterior design sports a new, massive front end. If everything stays untouched, the truck will host a large grille and a striking bumper. The face is additionally embellished with a pair of C-shaped LEDs and a pair of vertical fog lamps. GMC will continue to offer a topping Denali trim level, which will definitely feature plenty of chrome elements, so we can’t wait to see how it will look the shiniest new-gen Sierra 1500. As for the rest of the bodywork, well, as we see it, the new pickup looks less rugged from its predecessor, especially with new wheel arches, which are slightly less pronounced. Both grille and tailgate will continue to feature “GMC” badge, but the rear bulge suggests that the badge might be significantly larger than it is now. A new visual identity isn’t going to be completed by a new architecture. 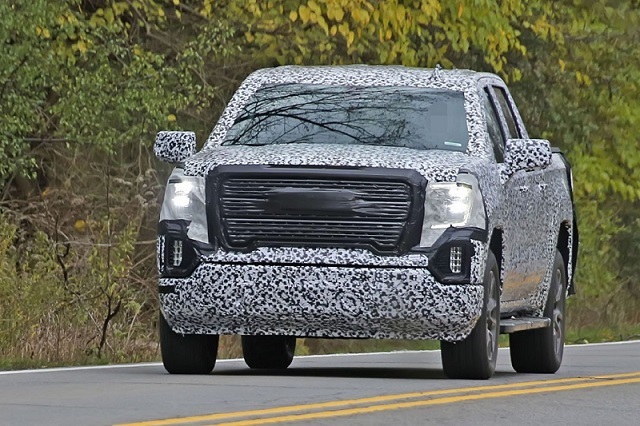 The 2019 GMC Sierra 1500 will continue to ride on GM’s K2XX body-on-frame platform. Still, the overall performance will be improved by a new transmission and several new engines. More precisely, the redesigned pickup truck is getting a 10-speed automatic transmission across the range. Even though the majority suggests that the existing V-6 and V-8 options will be carried over, we highly doubt. Instead, they will likely come upgraded. That’s not everything, of course. As we’ve announced earlier, the truckmaker will add a diesel unit this time or even two. The oil-chugging model will reportedly offer a 4.5-liter V8 Duramax with the ability to deliver 310 horsepower and 520 pound-feet of twist. No, that is not everything either. GMC will introduce the performance-oriented 2019 Sierra 1500, which is going to use an existing V8 “better” for a supercharge technology. This should be enough to beat Ford’s 450-hp powerful Raptor. In any case, the siblings are heading to Detroit and 2018 NAIAS, so we will see which one is the better option. We always vote for GMC, but that’s our subjective opinion.